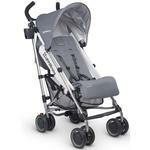 Uppababy G-LUXE 2019 Stroller - Free Shipping! 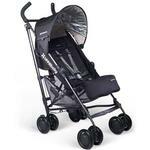 At just under 11 pounds, the G-LUXE is one of the lightest reclining umbrella strollers in the world. Updated with sophisticated fashions, featuring a removable seat pad and StainDefend fabrics, the G-LUXE holds up against spills and stains synonymous with toddlers. 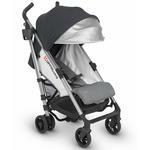 Weighing in at just 11 pounds, the G Luxe is the lightest full-size reclining umbrella stroller in the US. 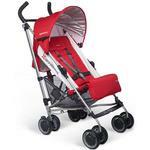 Its infinite recline (up to 120 degrees) makes it great for those unexpectedly long trips when your child needs a nap. New 3 position backrest recline part: no more strings that break! Easier to remove base seat fabric no more screws! 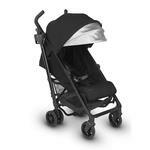 Lightest full-size umbrella stroller with recline in USA- 11 lbs. Suitable from 3 months- 50 lbs. 11 lb. aluminum frame and shoulder strap. Elevated handle height reduces hunching. High performance extra-wide wheels for smooth ride. Think you need to be home during naptime? Not anymore. 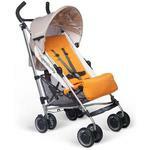 Introducing the G-LUXE — a car stroller, nap stroller and umbrella stroller combined. Doing errands or seeing the sights during naptime? Your child can sleep comfortably in our reclining seat with adjustable footrest. G-LUXE’s hand-level triggers make it easy to fold it with just your fingers. Once folded, G-LUXE stands on its own and out of the way. 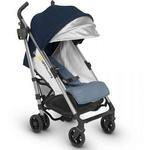 Pull-out sunshade extends to shield your child from harmful UV rays. G-LUXE’s seat pad can be easily removed for washing away your child’s spills. Machine washable. FOLDED: 12in W x 16in L x 42.5in H.